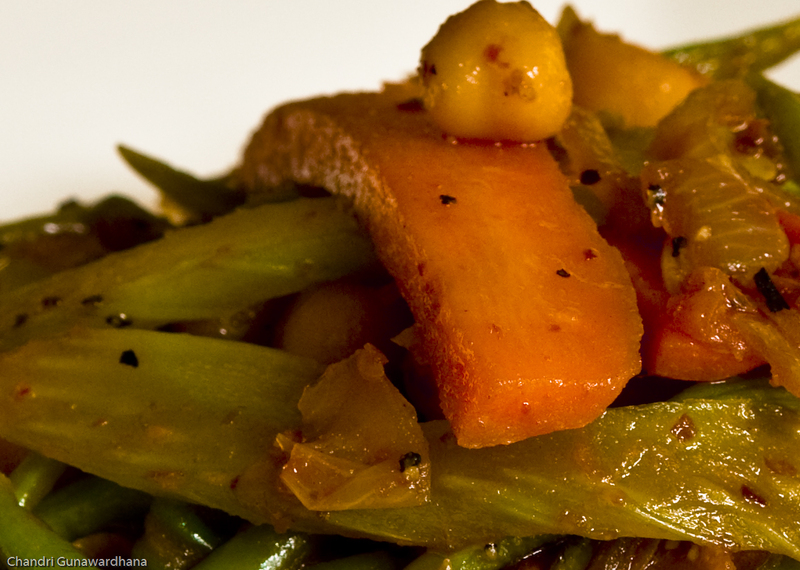 A vegetable stir-fry is a very versatile dish. It is a good accompaniment to meat and seafood when served with rice or noodles. I have served vegetable stir-fries with Chinese, Thai, Indian, Malaysian, Indonesian, Cambodian and Sri Lankan cuisine, to name but a few! When serving with Chinese or Thai food, ingredients such as straw mushrooms, bok choy, kai lan, kang kung, water cress and mange tout could be added to carrots and celery. I use button mushrooms, long beans, bean sprouts and lotus roots for Malaysian, Indonesian and Cambodian stir-fries. And for Sri Lankan or Indian meals, I throw in some chickpeas, pink onion, okra, greens peas and paneer onto beans and celery. An array of spices or sauces could be added to suit the type of meal selected. My personal favourite for a Chinese vegetable stir-fry would be soy sauce and sesame oil. Thai stir-fried vegies go well with fish sauce, spicy Thai chilli and shrimp flakes. For Malaysian and Indonesian fare, I use dark sweet soy sauce with sliced fresh red chillies. I usually add light soy sauce, unroasted curry powder and chillie flakes for Indian and Sri Lankan versions of this easy to assemble all-year dish. It is so easy to prepare, and there are so many variations using different types of vegetables, that it has become one of my favourite side dishes at most Asian meals I serve at home.